We are pleased to announce some extremely exciting news: Natalie and I are offering a workshop that is feature packed, filled with several one of a kind photographic opportunities, and designed to help you improve your photography in a short time! This weekend workshop will take place in Page Arizona. The itinerary for the workshop was designed by Natalie and I with two goals in mind: convenient travel arrangements and exciting photographic opportunities. We will meet you in Page on Friday evening and we will travel together, caravan style, to the different photographic locations we have on our schedule. We will begin our day at the famed Horseshoe Bend. This is one of the most hidden treasures of the area and sunrise there can be an unforgettable experience. Morning and mid-day will be spent in Upper Antelope Canyon. This jewel of the Southwest is one of the most sought after photography locations. It will be your turn to create your images of this photographic wonderland. Later on that afternoon we will conduct a print review (bring some of your work, between 4 and 10 prints, 8x10 or larger). 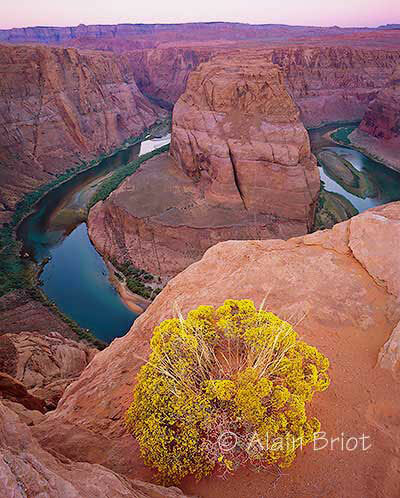 In the evening we will photograph sunset over Lake Powell from one of the best overlooks around. 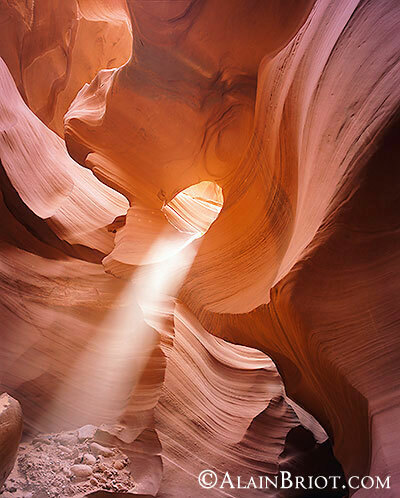 Photographers love Antelope Canyon because it is one of the most photogenic natural sites anywhere in the world. Antelope Canyon actually consists of two separate canyons, about 5 miles apart from each other: Upper Antelope and Lower Antelope. 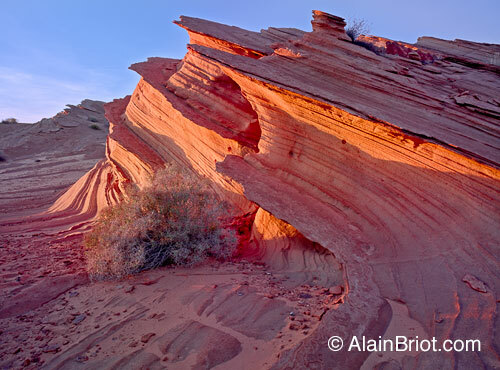 Most workshops take you to either to the Upper or the Lower part of Antelope Canyon, as these two canyons are called. But, doing so means that you only get to see half of this wonder of the world! Well, not anymore. We have decided to take you to both Upper and Lower Antelope Canyon in the same workshop! That way you can really say you saw it all (and photographed it as well)! Plus, since we will be in Page, land of incredible rock formations and scenery, we couldn't pass up the opportunity to show you some of our other favorite photographic locations. So, we decided to also take you to Horseshoe Bend, one of the most amazing overlooks over the Colorado River, for sunrise. We will also take you to a remote location where you will find Hoodoos, whimsical rock formations that are particularly photogenic, for sunset. 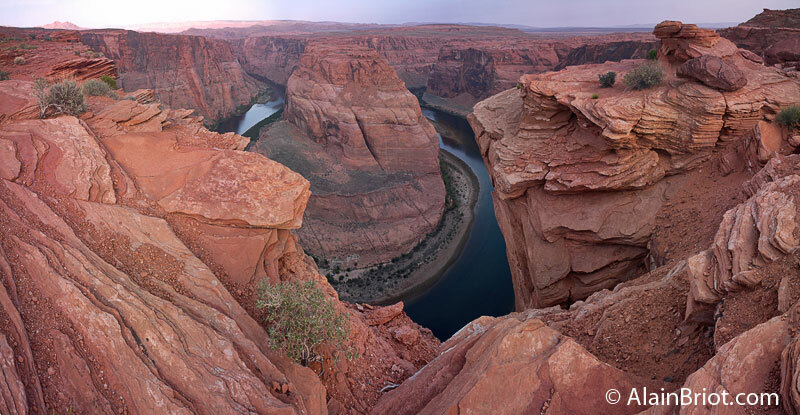 You will also have the opportunity to photograph Lake Powell at Sunrise and at Sunset from two fantastic overlooks. Lake Powell is world-famous for the incredible sandstone formations and for the unique colors the rocks take at sunrise and sunset. Finally, we will be taking you to some of the lesser known areas, some known only to Natalie and I, including slot canyons and other locations that we discovered on our own over the many years we have been exploring this area. This is truly a unique photographic workshop from which you will return with a great collection of images to add to your portfolio! Furthermore, you will be practicing Photographic Skill Exercises daily. We will have handouts for you and will be explaining these exercises in details. We will then work individually with each of you to help you with your exercises. Read on as there is more details about our Photographic Skill Exercises below. - Food, lodging, transportation and park fees are not included. Some participants prefer to camp rather than stay in a hotel. Some like to eat with the group while others prefer to be on their own. Some may have yearly Park passes, Golden Eagle passes or other. This arrangement provides for maximum flexibility while keeping the cost of this workshop to a minimum. - We will email you directions to Page as well as a list of hotels in Page when you register. You will then receive an email with the Friday evening meeting place and a detailed workshop schedule approximately 2 weeks before the workshop. - You are responsible for your own travel arrangements to Page and back and for your lodging arrangements. We will email you a list of accommodations in Page when you register. The closest major airport is Phoenix, Arizona. Page is located approximately 5 hours North of Phoenix, Arizona. A personal print review will be conducted during this workshop. This print review will focus on composition, print quality, image optimization, personal approach to photography, and more. Make sure to bring 6 prints of your work, 8x10" or larger print size, to share with the group. Our print reviews are friendly and helpful and will allow you to present your work, ask questions, and receive answers and feedback from both the group and the instructors. This is a print review, not a print critique. Our goal is to help you improve your skill and build your confidence level regarding your photographic skills. If you participated to one of our workshops previously we strongly recommend you bring photographs created during this other workshop. All monies are non-refundable. If you cancel participation in this workshop your registration fees may be transferred towards registration in another Beaux Arts Photography workshop under certain conditions. Transfer of fees to another workshop is not automatic and is decided solely by Beaux Arts Photography as a courtesy. We reserve the right to decide whether to transfer your fees to another workshop or not. Not finding the weather agreable, forgetting your equipment, being unwilling to follow the rules and regulations established by parks and monuments are not valid reasons to receive a refund or transfer to another workshop. You must register for another workshop within one year from the starting date of the workshop you originally registered for. Participants transferring from another workshop will be registered for this other workshop in excess of the regular number of participants. We can only accept two transfers per workshop. If you decide to attend a higher priced workshop, or if the workshop fee has increased, the difference in cost between the two workshops will be charged to your credit card when you notify us that you want to sign up for this other workshop. A ten percent transfer fee will be applied at the time of transfer. In order to get a transfer credit you can only cancel one workshop, Summit or seminar per calendar year. Your registration is guaranteed only when we have payment in full. We reserve the right to change this policy at any time. Workshop fees can only be transferred to another workshop and cannot be used towards purchase of a product such as mats, portfolio cases, CD or DVD tutorials, prints, portfolios, or other. Workshop fees cannot be transferred towards purchase of the Mastery Workshop DVDs. We cannot transfer consulting fees towards workshop registration. If this workshop is cancelled by us you will receive a full refund. By registering for this workshop you agree to this policy.